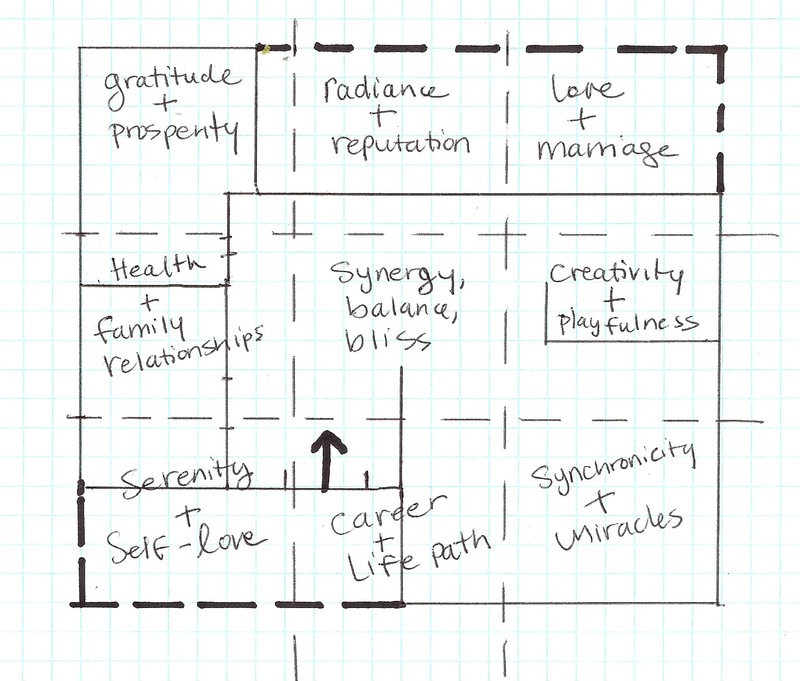 You can absolutely draw your very own bagua – or feng shui map. That way, you’ll know the location of each power center of your home. Believe me: it’s really not as hard as it may sound! It just entails a tape measure (just to get it as close to scale as possible), a piece of graph paper, and a tiny bit of patient determination. 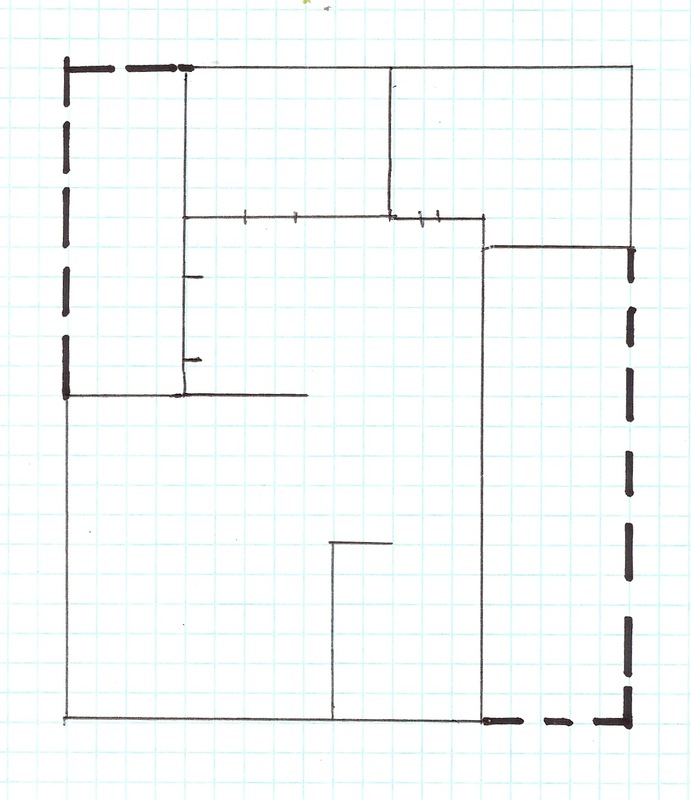 And keep it simple: all you need to draw are the walls, doors, and perimeter of the space. (No need to worry about things like windows, toilets, or drawing the burners on the stove!) Again, there’s no need to go crazy: just get it as close to scale as possible so that you have a good working idea of the layout of your home. If you live in an apartment, just include the boundaries of your personal space. Include attached balconies or attached covered patios. 2. Draw an arrow at the front door/main entrance (as intended by the architect, even if you use another one more often) that’s pointing in toward the home. 3. If necessary, rotate the paper so that the arrow is pointing up. 4. 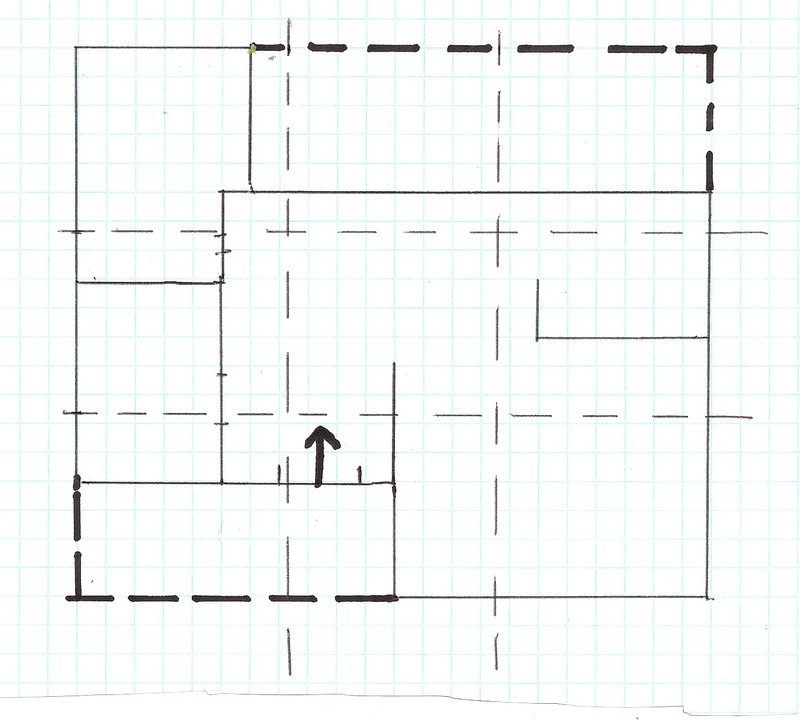 Draw a tick-tack-toe board over the square/rectangle, dividing the floor plan into nine equal parts. 4. Write the essential names of the bagua areas on each area as below. Gratitude and Prosperity: Wealth and Prosperity. Please note: for additional floors, the floor plan extends straight up or down from the floor containing the front door. In other words, if it’s directly above (or below) the prosperity area, it’s also the prosperity area. Please also note: if areas are “missing” from your floor plan (i.e. if they are outside of the house), don’t worry: this post has got you covered. …And if you have any questions, be sure to leave them in the comments. Hi, Tess! Thank you for these great posts. I have a question about changes, though; I posted on Facebook as well. My house was built in 1924. I learned that the current side door used to be the front door, many many years ago. But multiple families have been using the current front door as "the" front door. When someone makes such a switch what happens to the bagua? Does it change or stay the same? (I know what I feel in my home, but I'd love a more expert opinion…) Thank you! Hello dear Melissa! Thanks for reading and commenting. I usually say the front door, for all feng shui intents and purposes, is, "the front door as intended by the most recent architect." If it's just a door that you use more often than the front door, it's not the front door. But if it would appear to a real estate agent or anyone else that it's the actual, present day front door, then it's the front door. If there's still any confusion about what door to use, I would consider things like the placement in relation to the street, mailbox, address numbers, and what door people intuitively go to when they've never been there before. I hope this answers your question? i liked your comment about the tic tac toe aquares. Much easier yo remember when diviving into 9 spaces. After reading the above comment I have to think about our "front" door! In our case it is for decorative purposes (and emergency exit) only. It has not opened more than once or twice in the last ten years! We have a side porch door and a mudroom back door. Hi, I've been trying to draw this up ever since I bought your book "Magical Housekeeping" years ago, but I keep confusing myself. You see, I'm a student, living in shares accommondations with 3 other students. We each rent one room with a teeny tiny kitchen, and share the bathroom and a hallway. Hi dravite! If I were you, I would just concentrate on the bagua of my very own space, using the door to your room as the "front door." Hope this helps! Hi Tess, great job on this series! Your take on this subject is so clear. I have attached to my house not a solid covered porch but an open trellis covered with a climbing rose. Should this be included? Hi Sunshine! Glad you like the series. Is the trellis an architectural addition to your home, or more of a garden addition? Wow! My mom sent me the link to this site and now I know why! I have been interested in Feng Shui for years and you are the first person to address the subject of Feng Shui for apartment dwellers! Thank you for remembering that you don't have to own a home to want to affect the chi of your space and your life. Hi! I’m loving your series, thanks! I’m trying to apply the bagua individually per room. In the masters bedroom, was wondering if the walk in closet and en suite bathroom should be part of its bagua map? Thanks! Hi Kathy! If the master bedroom is a perfect square or rectangle without the closet and bathroom, I wouldn’t include them. If they are included within the square or rectangle that is the master bedroom, then I would. Does that make sense? Blessings! I have an attached and covered front porch that runs the entire front legth of my rectangular shaped house (typical log cabin with porch). This is also where the front door is located (at life path/career). Do I treat the porch as an extension and extend the NE/N/NW behind the front door, or do I treat the porch as part of the house and center the map off the front edge of the front porch? Thank you so very much! Hi Rebecca! I would treat the porch as a part of the house. That sounds super cute by the way. Hi Tess, it was a really nice job, thank you. So, our front door is in the front of the house but when we enter, we face a wall (It looks like a really tiny square, about 3 ft each side) and then turn to the left to really enter the living/dining area. which direction should I choose? Entering and facing the wall or when we turn and really enter the main areas? I’m assuming that the order of the bagua is fixed such as gratitude/prosperity being the upper left or NW corner and all else to follow? Do you have any articles about the better placement of bathrooms, bedroom, etc., with regards to these areas of the bagua? I am attempting to place things for a studio guesthouse and it seems that the bathroom door will break the rule of not facing kitchen, bedroom or dining room as it’s a studio.